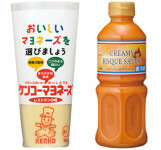 Company Name: KENKO Mayonnaise Co., Ltd.
We at KENKO Mayonnaise Co., Ltd. conduct three major businesses: 1) manufacturing business; this effectively utilizes the company’s expertise of manufacturing mayonnaise, dressings and long life salad, 2) delicatessen business; our subsidiaries with production knowledge of fresh delicatessen and designing new menus, 3) shop & website business (Salad Cafe); Salad Cafe is an actual retail shop of fresh salad and a website store opened with the concept of ‘salad brings a new world to our meals’. Each business supports the others and we attempt to satisfy our customers by collection and distribution of adequate information. Mayonnaise and Dressing manufacturing business (our origin and home ground) is the integral part of our business. Since the establishment, we as a manufacture of products for business use, respond to our professional customers by developing many different types of mayonnaise and dressings. We have various kinds and shapes in our mayonnaise. Some examples are: cubic shape solid mayonnaise for frozen products, and powder type one for potato chips to add mayonnaise flavor. We continue to introduce new products that meet the change of the market environment, by designing various shapes of products, establishing adequate production systems and introducing new manufacturing methods/technologies. 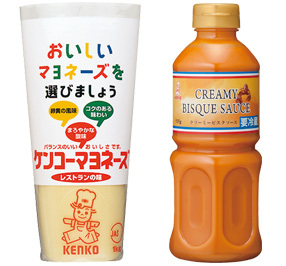 In addition to that, we conduct marketing activities by creating the KENKO Sauce World and commercializing sauces from all over the world as its “the world’s sauce series”. We have developed the nation’s first ‘long-life salad’. This long lasting salad is a brand called FDF (Fashion Delica Foods), which is widely used at restaurants, bakeries and convenience stores. Being the №1 Salad Company, we continue to design salad cuisines and, to give further stimulation to the market, we will take the following activities. We dedicate ourselves to product development as the industry’s first manufacturer of long-life salad and as a leading company with the highest market share. In our egg products business activity, we manufacture general processed products of egg including egg salad, which is used for sandwiches and snack breads, Atsuyaki-Tamago (Japanese style rolled omelet) for lunch boxes, Kinshi-Tamago (narrowly stripped cooked eggs) used for cold Chinese noodle, and boiled eggs for Oden soup. We are to build a factory, which equips integrated manufacturing system from shell egg to any　egg products through continuous line. 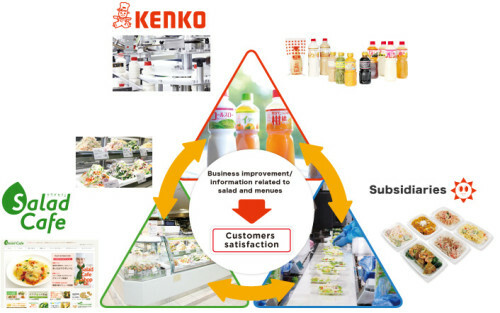 With the concept of providing safe and reliable products as principle, we at KENKO Mayonnaise Co., Ltd continue to produce various egg products.